One of the problems with having a great name like “David Stuart” is that everybody wants it. There are seemingly millions of us out there, with hundreds of thousands in academia alone! 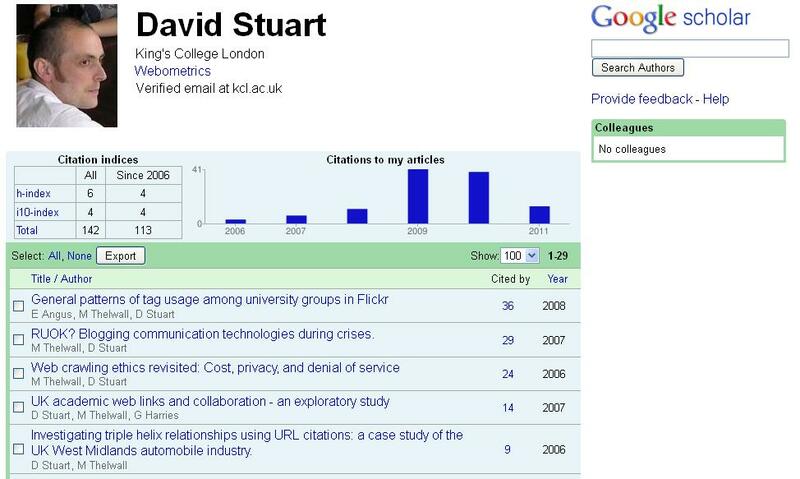 The briefest of web searches will find David Stuart the mathematician at the University of Cambridge , David Stuart the Mayanist at the University of Texas , and of course David Stuart the great webometrician now at King’s College London. Added to this the problem of multiple David Stuarts is compounded by people who think Stuart can also be used as Christian name as well, e.g., David Stuart Davies, Google trying to help with alternative spellings, e.g., Dave Stewart. 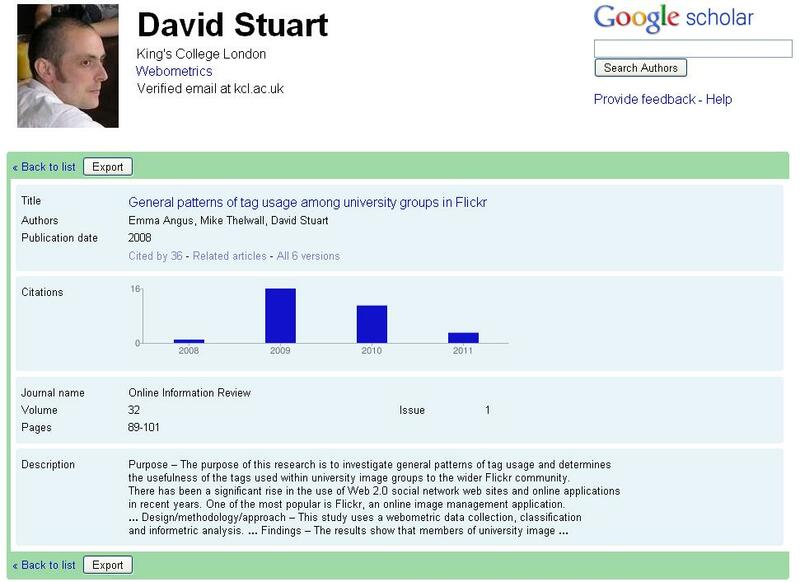 All this means that it can be extremely difficult to keep track of my publications on services such as Google Scholar. Keeping track of my publications and how they are being cited is not just about vanity searching (although admittedly there is a bit of that). It’s also about keeping track of work that is likely to be of interest to me, helping me understand the impact my work is having, and helping other people distinguish between my work and that of other people called David Stuart (i.e., separating the wheat from the chaff). Google has now made this easier with Google Scholar Citations! 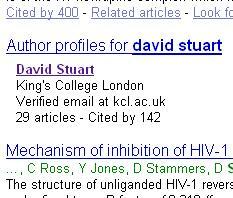 Go to Google Scholar now, and do a search for David Stuart and between two highly cited papers on HIV, you will a link to my academic profile. Clicking on this link will show the 29 articles that I have individually added to my profile (although there is the option of adding them automatically, the popularity of my name means this wasn’t suitable in my case), and may be trusted to the extent I can be trusted. Clicking through presents the full list of my publications and some stats about my citations. As well as basic citation information for my overall collection of work, it is also possible to look more closely at one particular paper. For example looking more closely at my most cited paper it would seem as though it’s best days are behind it as it got less citations in 2010 than in 2009. Google Scholar is a very useful service and it’s great to see it continuing to develop [could we have an API next please]. Whilst it doesn’t provide the quality of services such as the Web of Science or Scopus, it fills a gap in the market by including a far wider range of publications and making the service universally accessible. Allowing users to create profiles provides the possibility of more structure to be imposed on the service. At the moment it’s in a limited launch, and none of the people I have worked with have created profiles. Once they do, however, and they are listed on my profile as my ‘colleagues’, it will be far easier to make use of our academic networks in finding useful information. Unsurprisingly, as with any new service, there will are some things I don’t like, so here’s a few of my thoughts as I entered my details. Verification by an academic email address. It seems bizarre that my profile is now public as it is verified by a King’s College London email address, which doesn’t appear on any of my articles, whereas I couldn’t have had a public account eight months ago despite having access to the email accounts that actually appear on the papers! Embedding profiles/citation information. It would be great if there was a simple way to embed some of this data in my web pages. Differentiate between publication types. My profile page shows a list of publications, but you have to go into each one to see the type of publication. Sort by author. You can sort my list of publications by year, citations, and title/author. It does not allow sorting by author alone, which is important as people are often most interested in papers where a person is first author. Public/private. You can either have your profile as public or private, but not part public, part private. I have a number of publications in professional magazines rather than academic journals, and whilst I want to keep track of them myself, I don’t necessarily want them listed on my public profile. Compounding errors. When adding records manually you have to add them in such a way that Google Scholar can associate it with a record in it’s database. This means that if Google Scholar has an error, you have to compound the error to include the citation data. For example, I wrote the article “Programming skills could transform librarians’ roles” in 2009, but it’s listed in Google Scholar as 2010, unless I enter it as 2010 it won’t identify the appropriate citations. In this case the difference is relatively minor, but they are not always so. It should be possible for me to match my record to the one in Google Scholar even if they are not exactly the same. Importantly this would enable Google Scholar’s community of users to improve the Google Scholar database.